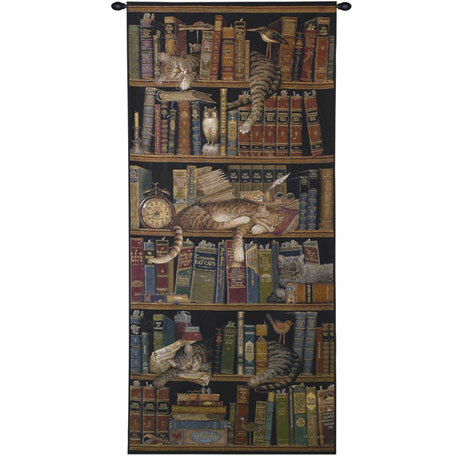 American artist Charles Wysocki (1928-2002) loved cats and books. His painting "Classic Tails" has both: four cats blissfully snoozing on shelves full of books and, for fun and sweet kitty dreams, little bird sculptures. Jacquard-woven in the USA, this appealing tapestry is full of depth and texture, shadows and light. 100% cotton, lined in cotton, top rod pocket, weighted bottom. Spot clean or dry-clean. Specify Small (27" x 55") or Large (34" x 75"). Black metal hanging rod (sold separately) adjusts 22-56". Hanging hardware included. No rush delivery or gift box.